For over 20 years Vermont Teddy Bear Company has produced high quality stuffed bears right here in Shelburne, VT. These bears have quite the reputation. Not only are they a household name in the Green Mountains, but they have a nationwide following. They’ve even been featured on the Simpsons! Vermont Teddy Bear has something for everyone. With hundreds of bears to choose from, it’s tough not to find one you like. Nearly everything is manufactured by hand with pride in the USA, and there is a considerable amount of detail in each bear. The limbs are posable, the nose is made of suede, and the eyes have the signature “Born in Vermont” written on them. These bears are childproof and handmade. Not only will they last a lifetime, they’re also one of a kind. 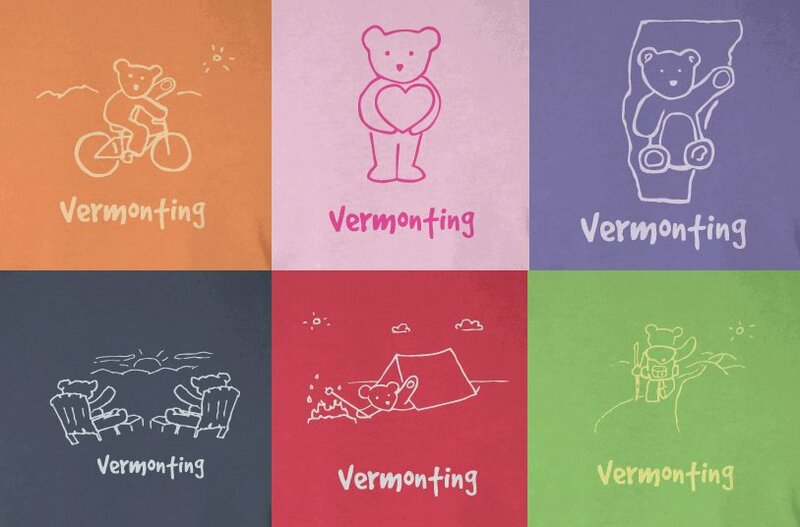 We are proud to work with Vermont Teddy Bear and help them produce their line of custom tees. Sold only at the factory in Shelburne, these tees come in a wide variety of colors – each with a different image of a bear. These bears love “Vermonting:” they camp, ski, and lounge around in Adirondack chairs! The playful illustrations are printed on comfortable, durable tees with a classic cut – much like their teddies! As you may see in the pictures, VT Teddy Bear uses a tonal effect to match the ink color to the shirt dye. These creates an attractive design that is subtle and easy to like. These shirts are a blast to print!